This weekend saw over 60 5 series cars at the Annual St. Patrick’s Day gathering for a bunch of guys and girls who feel much like I do – the best BMW Series over the years has been the 5 series. It has great lines, is available in various formats and power ranges, and is the most versatile of the BMWs. It was a great event organized by one of my customers and I got to see some great cars and to show off my latest project . . . I became a ‘5er guy’ about 7 years ago when I purchased my first five series, a 1984 533i, from a customer who didn’t want to spend the money to replace an ailing cylinder head. I loved this car. It had plenty of room, decent power, and handled like a dream. I could pack my trunk full of stuff, and throw four of my friends in in and load a bunch of surfboards on top. 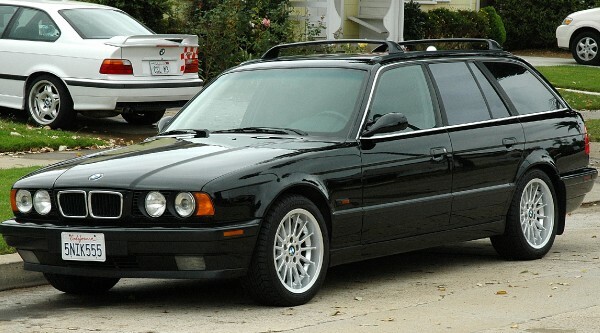 I graduated into a 1995 525i touring (station wagon) a few years after. This might have been the best 5 series I’ve owned. I changed it to a 5-speed transmission, put in a sportier suspension, and it was in immaculate shape. It could do everything that my first five could do, plus get large things from Home Depot back to the house. My wife wasn’t a huge fan however, as she thought it made me look like a Dad on the way to soccer camp. Circumstances arose that had me replace the 525it with my current daily driver, a 2000 BMW M5. This car isn’t as versatile, and I’m hesitant to throw boards on the roof, but it is one amazing ride. It is great on long trips, handles like no other 5 series I’ve had, and you can still fit four friends in and then scare the living daylights out of them going from 0-60 in under 5 seconds. Plus it really is a great looking car. Simply put, you don’t need to read a bunch of reviews to figure out what makes the 5 series so great. Drive one. If you own a 7 Series you’ll be impressed with how much lighter it is and how much better it handles. If you own a 3 series you’ll notice that it handles almost the same but you’ve got space! If you own a 6 series . . . well, that’s another topic for another day. A great write up on the 5er…yes, we’re a cult. Love that 533, awesome color combo. Your steering wheel is beautiful. I never thought I’d say that about a steering wheel.